A man dressed as a police officer goes on a murder rampage across New York City. The police uniform represents authority and is supposed to be a symbol of security. So imagine the surprise of someone expecting help, only to get murdered by one of the boys in blue. That is the general premise of William Lustig's "Maniac Cop." 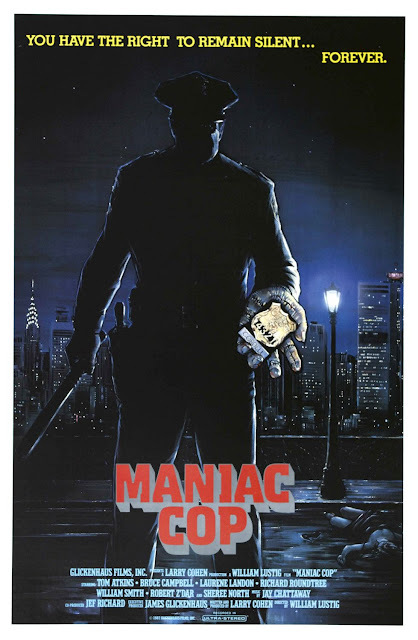 Besides this film, Lustig is known for directing the original "Maniac," and two of the "Maniac Cop" movies, so it's safe to say he likes maniacs. In fact, more than a third of the non-pornographic films he has directed have been about maniacs. The movie is written by Larry Cohen and is about a cop murdering people in New York City. Simple enough, but can it be effective? It stars Tom Atkins as detective Frank McRae, who is investigating the murders. Joining him are Bruce Campbell, Laurene Landon, Sharee North, who are all suspects or suspected accomplices in the killings. Also in the film are Richard Roundtree and William Smith, who play horror movie stereotypes in the form of dumb figures of authority. This flick is a clumsily made, poorly constructed 80's slasher flick that is only interesting at all because the antagonist is a cop. The feature starts out like any other whodunit mystery as detective McRae looks for evidence to find the killer. It becomes very apparent very quickly this is not a true mystery. There are no real twists or turns, and the only reason we don't know the killer is that the character hasn't been introduced. There is a false suspect, but that individual is not there for our benefit since we know immediately they are innocent. They are only there to be placed in circumstantial situations. As we mentioned above, what kind of horror movie would this be without there stereotypical dumbass authority figures? These idiots keep pointing the finger at the innocent suspect all while the killer goes free. This all happens despite the fact that the lead detective on the case has already told them they have the wrong guy since he was attacked by the killer while the patsy was in custody. UGH. The script is extremely poorly written and doesn't exactly make a whole lot of sense. There is no rhyme or reason to anything, and there is no organic narrative whatsoever. This movie would be alright if the slasher elements were good, but even the murder parts are mediocre. The only redeeming quality of this movie is Bruce Campbell and a 'blink and you miss it' social commentary about police abuse of power that still remains relevant today. Sadly, "Maniac Cop" is a dull affair.